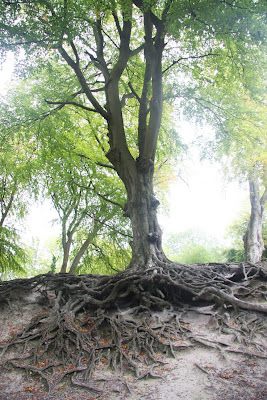 I saw this tree with almost all of its roots exposed while walking on the South Downs last weekend. The tree was growing at the side of a pit - probably man-made. I'm sure it can't be too good for the tree to have so many roots exposed to the air rather than sunk deep into solid earth, but I thought it was worth photographing. It was rather gloomy in the pit and I had to overexpose the photo a lot, otherwise the roots were lost in shadow. I also had to Photoshop out some litter that was entangled at the base of the tree. Next time I go for a walk, I'll take a rubbish sack. Not only is it public-spirited to clear up other people's mess - it is also easier than using Photoshop!